No, I didn’t almost just get hit by a car; nor did I have a head-on collision with an eight – although those things have happened to me in the past. Nope, today was one of those rare days when I could really appreciate the moment in which I found myself – what I was doing, how I was feeling; everything about my physical, mental and emotional being felt just right. No regrets about anything in the near or distant past, and no worries about the imminent future or farther down the road. It happened about half-way through a blissful 10-mile row around mid-day today, after I had made the turn near the Watertown dam on the Charles River, and was moving nicely downstream amidst flat water, cool crisp fall air and the beginnings of foliage season in the Boston area. I hadn’t rowed since Friday and therefore missed Saturday’s 2 x Head-of-the-Charles workout. It was a deliberate decision, as the Green Mountain race last weekend, combined with some tough workouts during the week’s coaching sessions had left my back feeling sore on the right side. In any case, as a result of the time off , I felt pretty rusty and tired after pushing off of the dock at Riverside. I only planned to row steady state, however, as tomorrow is coaching day and, with only two weeks left until the Head of the Charles, this will be our last really tough week. As usual, I continued to focus on technique, especially my finish, which has needed a major overhaul for years (see “way back on the layback” blog). Essentially, I have too much layback. I think it has improved somewhat – at least my ability to keep it in the front of my mind during pieces has improved – and I’m finding that when I get tired, which would be the time in past years when I’d start to slouch and dump into the bow, I’m now able to focus more on the technique of finishing properly. I don’t know if I’m actually doing it, but I am focusing on it, and it seems to help. I keep hearing Coach Milos’s voice saying “sit up at the finish John…sit up…that’s it John…” Not yelling and criticizing, but observing and encouraging me when I’m at my most tired. I arrived at the final upstream stretch of the river before the u-turn at Watertown, having rounded the final bend and leaving the Newton Yacht Club behind. The boat just felt good. I felt good. I upped the pressure a bit and everything just zinged along. The water was like glass, and, rather than obsessing about the finish, I was finally able to focus on the catch, trying to get my blades in right at the end of the recovery, gently plunking them in before I grabbed the water and moved everything through the drive. It felt like it was working…the boat sang along the glassy water and the extra effort I put in (about 75% pressure) made me feel like I was doing some things right. It was an amazing, almost effortless feeling, and I not only felt lucky to be a rower, I felt lucky to be alive. 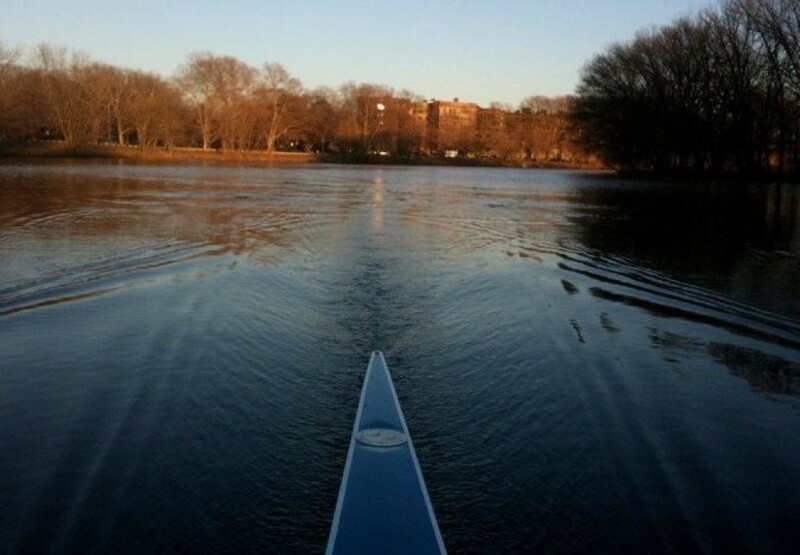 This entry was posted in New Rowing Posts, ROWING by John. Bookmark the permalink.